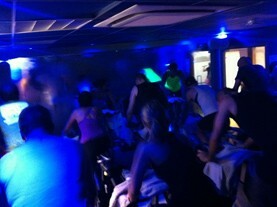 SpinAddikts® is the first private indoor cycling group in London. Within a year of moving to London, Frances had already attracted a core group of fitness enthusiasts including recreational to competitive athletes. The concept of SpinAddikts is to train regularly as a group similar to the spirit of a team, with attention given to each individual. The rides are structured differently depending on the particular type of session with a selection of the most upbeat music that changes regularly. As a group we progress together and the sessions become more difficult and challenging. One therefore constantly sees improvement instead of the usual frustration of a typical group exercise class where the workout becomes repetitive and one’s fitness level eventually plateaus and sometimes even declines. Heart rate monitors are used to monitor performance within appropriate ranges and to efficiently program exact training parameters. Newcomers are welcome and can take the workout at an easier pace or they can train with Frances privately on form and technique, and to build an aerobic fitness base before joining the group.